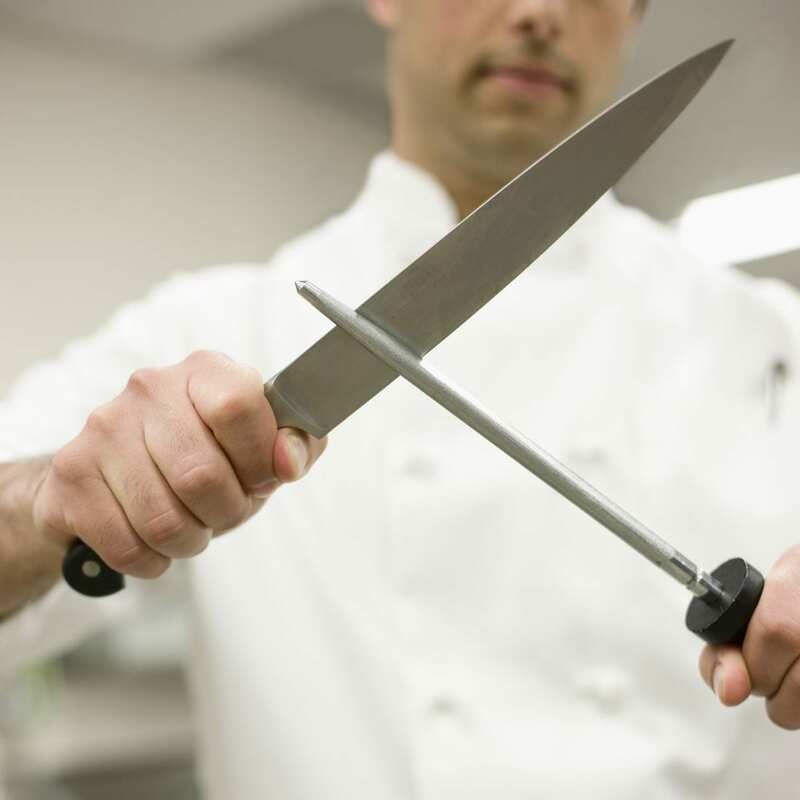 If you're a fan of cooking, you've probably seen professional chefs at restaurants or on TV sharpening their arsenal of cutlery with a long, stick like mini-jousting rod. BEHOLD, the sharpening steel! Though seen often and simple in structure, many are still perplexed with it's actual use. How the heck do you sharpen a knife with a stick? 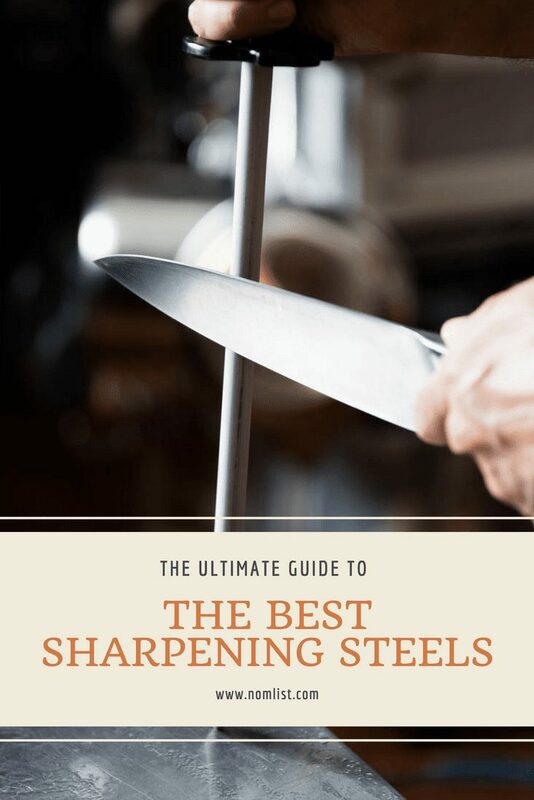 Well, we did the research for you and gave you the ULTIMATE guide to the best sharpening steels on the market and a little extra info, too! WHAT IS A KNIFE SHARPENING STEEL? So, what exactly is a sharpening steel? This awesome sword-like tool keeps the sharp edge of your knife super razor sharp by shaving off tiny bits of blade off. Most knives are made of extremely durable steel alloy, so they are made to withstand sharpening many times. However, a sharpening steel is not to be confused with a honing steel. With a honing steel, the blade is reshaped into a sharp configuration by slightly bending the metal into shape. No metal is actually shaved off of the knife during honing. Although many sharpening steels may look similar physically, many of them have different features. One of the most defining features is the material that the rods are made of. Some of the most popular materials sharpening steels are made of are steel, diamond, and ceramic. No, we did not stutter. This is the most common type of sharpening steel since the material is extremely durable and easy to clean. Usually, steel is chosen since they are easy for daily maintenance. Generally, these are on the more affordable side since they are cheaper to make than other materials. You can find these typically in a knife set. However, one downfall is that Japanese blades or any soft blades CAN NOT be sharpened with them. Since the steel is too abrasive, the blades will deteriorate, chip, and become ruined. Diamonds are forever, as they say. In this case, these sharpening steels are coated with super abrasive diamond particles that will really get your knife edges pin-point sharp. However, be wary. Since the coating is very rough, the friction causes the diamond particles to slough off easily, making the rod not as effective. Be sure to choose a high quality product that we suggested below so you don't have this issue. Ceramic steels are like the three bears and goldilocks, just right. Not only do they sharpen better than steel sharpening steels, but they're also a more affordable material than diamond steels. They can also sharpen anything from your best bread knife to a fish filet knife. Again, be careful! Ceramic sharpening steels don't have the greatest longevity since prolonged use can cause them to crack. If you are right-handed, hold the sharpening steel pointing straight down perpendicular into your cutting board in your left hand (reverse if you're left-handed). With the opposite hand, cut into the steel at a 25 degree angle from the steel with a sweeping motion. It will look sort of like you are trying to slice a sliver of the steel off. Pull the knife backward toward you. This means you will start at the thickest part of the knife all the way to the tip when you slice through. Make sure to not put too much pressure, just graze the steel firmly. Switch sides and do the same steps with the other side of the blade. Do this about 4-6 times each time you are ready to cut! If this is a little confusing, check out how Chef Gordon Ramsay sharpens knives like a boss! When choosing the right sharpening steel, you have to keep a few things in mind. Some can get a little heavy so be sure to pick one your strength can handle! If you're looking for a sharpener that will give you the razor cutting edge you need to refine your chef skills, this is the sharpener for you. Coming in a 15.88 inches in length, this sharpener is made to sharpen even your longest knives. Packed with tiny diamond particles, the sharpener hones and refines your blades to perfection. The super comfortable non-slip grip makes sharpening light and easy on your hands. Plus, the handle includes a hang-up ring, which makes storing this tool a breeze. Also, the plastic sharpening tip protects your counter from getting ruined while you sharpen your favorite knives. Overall, this sharpener is an excellent started diamond sharpener for those who want to try one out for the first time. Want a diamond sharpener that fits the quality and affordability you need to keep your kitchen knives like new? Well, we got the perfect product for you. DMT is arguably one of the best in diamond sharpening technology. The diamonds are actually more concentrated than most other brands, making the sharpener last longer and more effectively. This specific model comes in a 12 inch length, but they offer 10, 12, and 14 inch lengths as well. Also, there's a handy hanging loop, giving you extra storage space in your accessories cabinet. Plus, you can use this sharpener not only for kitchen knives, but other sporting and outdoor knives as well. If you're a little more experienced, we highly recommend this diamond sharpener for you. Have you ever dreamt of having perfectly sharpened knives but struggled with achieving this goal? Well, worry no more because the Euroline Bob Kramer Ceramic Sharpening Steel is the answer to all of your problems. This gorgeous sharpening steel is made from sturdy ceramic that simultaneously hones your knives while you sharpen them. This ranks at 70 Rockwell hardness, so you know it's not going to break on you any time soon. Coming in at 10 inches, this beast rod will sharpen most regular sized kitchen knives. By far, this is one of the highest quality sharpening steels on the market. Once you try it, you'll never want to go back to your old sharpener.